Rotary Files are two cabinets in one, without the messy drawers. 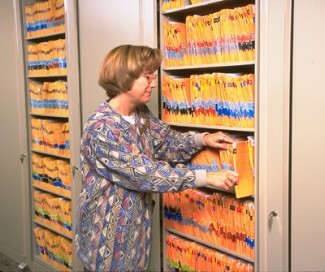 Rotary Files can be accessed from both sides of the cabinet for twice the retrieval time. Unlike filing cabinets, Rotary Files allow for customization for virtually all media types in the same unit. Rotary Files also allow for expansion with add-on units for growing offices. These units can be configured side-by-side, as an office partition, in an alcove, the possibilities for placement of rotary files is almost endless. Rotary Files come are available in letter, legal, EDP and A4 sizes. As with most filing systems on our Web site, Rotary Files can be custom designed to accommodate different types of media. Rotary Files are available under GSA contract. Please fill out our feedback form for more information.